When my wife and I purchased our home, we moved from an apartment with roughly 800 square feet of floor space into a house with about 2,000 square feet – and along the way, our biggest piece of furniture (an old, shoddy couch) was unable to make the move. This left us with a blank slate for decorating – but it’s not something I’m particularly good at. Part of our budget for the move allowed for this, allowing us to partially furnish our family room and living room by taking advantage of a furniture outlet store. Fast forward to our current lives. Our three year old son is beginning to regularly visit his friends – and, naturally, that means that we’re getting to know the parents of some of our child’s friends. One of these couples actually has a story very similar to ours – in the last few years, they moved from a tiny apartment into a much larger home and they didn’t move in the door with adequate resources for decorating or furnishing. Unlike us, however, they did not budget for such furnishing before the move, meaning that when they did move in, their only decorations and furnishings were what they brought from their apartment. Their front room – the one you would enter as soon as you came into their home – is completely empty. It merely serves as a very pleasant entrance into their home. The other rooms are largely decorated and arranged as they were in their old apartment. Their plan is to slowly replace and upgrade furniture and decorations as opportunities present themselves and they can afford it, but for now, things work for them. And it works well. The spartan decoration of their front room sets a clean and open tone for the rest of the house – and, best of all, it saves them money and time (it’s pretty easy to clean a room with no decoration or furniture). There are several useful decorating and home furnishing lessons to be learned here – some obvious, some not so obvious. Many people feel something of an obligation to fill their home with furniture. Don’t. It’s fine to have very sparse rooms in your home. Consider sparsely decorating the room that people see first when they enter so that they don’t immediately get a “cluttered” sense from your home. Not only will sparse decorating save you money, it will also save you time – and you’ll likely find that the “leap” from an apartment to a home costs you more time than you think. My wife and I made the conscious decision to have a decorating/furnishing budget when we moved, but reflecting back on it, it wasn’t really necessary at all. We could have easily left our front room quite barren and used our old furniture in the family room without skipping a beat, then slowly replaced or upgraded the furniture over time. Look for consignment options as well as thrift stores before you even begin to look at other options. You might find something you like at a low price right off the bat. What about decorating? This is one area where I think we did quite well – and we still are. Virtually all of our home decoration was hand-crafted by people close to us. We have a lot of photographs hanging up, the best of the thousands of digital photographs my wife and I have taken. We also have quite a bit of original artwork done by friends and family, including a few original paintings (one of which is stunning – done by a relative who actually paints professionally and we have one of her best works). This not only saved us quite a bit of money, but it also makes almost every decoration in our home have a very personal feeling. If we see anyone looking closely at a decoration, we always have a nice story associated with it – the opportunity we had to take the photograph, the person who made the decoration for us, and so on. This is particularly true when reusing things or using items unexpectedly. I’ve seen a very elegant apartment decorated with framed record covers from a person’s collection. Another person simply decorated much of her home in framed Calvin and Hobbes Sunday strips. 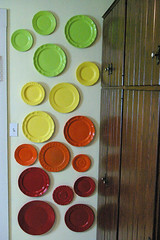 The picture above depicts an individual using plates for decorative purposes. Look at everything as a potential resource for decoration and you may find something very unique that costs almost nothing. Look at lots of homes through that lens. Look at the homes of all of your family and friends. Figure out what you actually like and don’t like. Doing this thoroughly will help you develop a good concept of what appeals to you – then you can seek to make those ideas happen as inexpensively as possible. I’ll go even further: the absolute worst place you can go to shop for furniture is a furniture store; similarly, the worst place you can go to shop for decorations is a home decor shop. Such shops only represent a salesman’s idea of what should go into your home, not your own idea. Formulate your own ideas before you ever walk in the door and you can focus on hunting for bargains instead of convincing yourself that this expensive item is perfect for what you want.